The FFBO dramatically increases the pace of discovery by enabling neurobiologists and computational neuroscientists alike to generate and test new hypotheses, by interrogating, visualizing and simulating the fruit fly brain at different scales, from neural circuits to neuropils and ultimately the entire brain. 1. N. H. Ukani, C.-H. Yeh, A. Tomkins, Y. Zhou, D. Florescu, C. L. Ortiz, Y.-C. Huang, C.-T. Wang, P. Richmond, C.-C. Lo, D. Coca, A.-S. Chiang, and A. A. Lazar, The Fruit Fly Brain Observatory: from Structure to Function, Computational and Systems Neuroscience Meeting, February 2017, Salt Lake City, UT. 2. N. H. Ukani, C.-H. Yeh, A. Tomkins, Y. Zhou, D. Florescu, C. L. Ortiz, Y.-C. Huang, C.-T. Wang, P. Richmond, C.-C. Lo, D. Coca, A.-S. Chiang, and A. A. Lazar, The Fruit Fly Brain Observatory: from Structure to Function, Neurokernel Request for Comments, Neurokernel RFC #7, December 2016. Underlying the architecture of the FlyBrainLab are 3 key building blocks: NeuroArch, Neurokernel and NeuroMynerva. They are briefly described below. 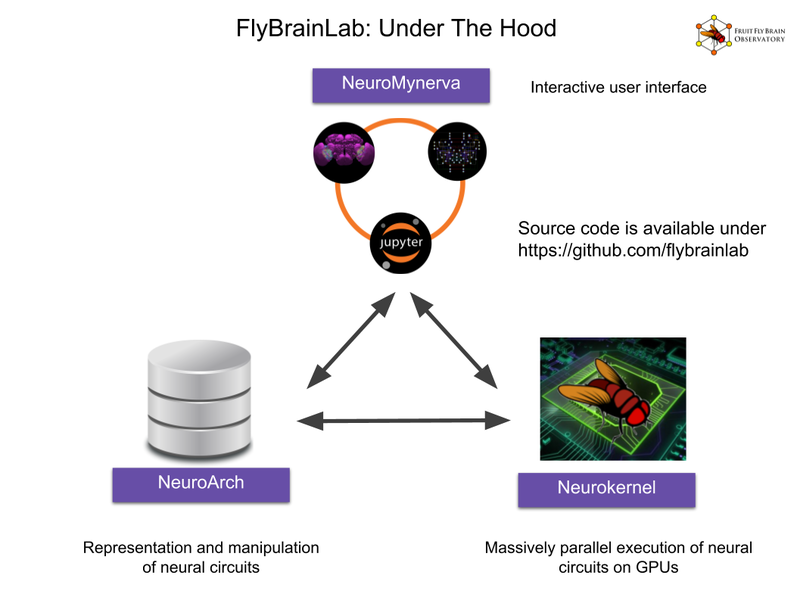 Neurokernel is an open software platform for collaborative development of comprehensive models of the brain of the fruit fly Drosophila melanogaster and their execution and testing on multiple GPUs. Neurokernel provides a programming model that capitalizes upon the structural organization of the fly brain into a fixed number of functional modules to distinguish between these modules' local information processing capabilities and the connectivity patterns that link them. By defining mandatory communication interfaces (APIs) that specify how data is transmitted between models of each of these modules regardless of their internal design, Neurokernel explicitly enables multiple researchers to collaboratively model the fly's entire brain by integration of their independently developed models of its constituent processing units. The framework is open-source and freely available; it can be obtained from http://neurokernel.github.io. Lev E. Givon and Aurel A. Lazar, Neurokernel: An Open Source Platform for Emulating the Fruit Fly Brain, Neurokernel Request for Comments, Neurokernel RFC #4, October 2015. Lev E. Givon and Aurel A. Lazar, Neurokernel: An Open Source Platform for Emulating the Fruit Fly Brain, PLOS ONE 11(1): e0146581, doi:10.1371/journal.pone.0146581, January 2016. NeuroArch is a database for codifying knowledge about fruit fly brain circuits. It is designed with two user communities in mind: (i) neurobiologists interested in querying the database to address questions regarding neuroanatomy, neural circuits, neurons, synapses, neurotransmitters, and gene expression, and (ii) computational neuroscientists interested in the instantiation of models of neural circuits and architectures, their program execution, and validation of hypotheses regarding brain function. Lev E. Givon, Aurel A. Lazar and Nikul H. Ukani, Neuroarch: A Graph-Based Platform for Constructing and Querying Models of the Fruit Fly Brain Architecture, Frontiers in Neuroinformatics , Number 42, August 2014, Leiden, The Netherlands. Lev E. Givon, Aurel A. Lazar and Nikul H. Ukani, NeuroArch: A Graph dB for Querying and Executing Fruit Fly Brain Circuits, Neurokernel Request for Comments, Neurokernel RFC #5, December 2015. NeuroMynerva is an interactive computing interface based on JupyterLab with a suite of highly integrated, user-friendly applications for data query, visualization and circuit execution. In NeuroNLP, neurons in the NeuroArch databases can be queried based on the neuropil that they reside in, their innervation/connection pattern and their neurotransmitter type. For example, to query and visualize the glutamatergic local neurons in the antennal lobe, one can simply type the query: show glutamatergic local neurons in AL. A flexible GUI provides additional power to refine the control of circuit visualization. 1. N. H. Ukani, A. Tomkins, C.-H. Yeh, W. Bruning, A. L. Fenichel, Y. Zhou, Y.-C. Huang, D. Florescu, C. L. Ortiz, P. Richmond, C.-C. Lo, D. Coca, A.-S. Chiang, and A. A. Lazar, NeuroNLP: A Natural Language Portal for Aggregated Fruit Fly Brain Data, Computational Neuroscience Meeting, Volume 18 (Suppl 1):60, BMC Neuroscience 2017, July 2017, University of Antwerp, Antwerp, Belgium. 2. N. H. Ukani, A. Tomkins, C.-H. Yeh, W. Bruning, A. L. Fenichel, Y. Zhou, Y.-C. Huang, D. Florescu, C. L. Ortiz, P. Richmond, C.-C. Lo, D. Coca, A.-S. Chiang, and A. A. Lazar, NeuroNLP: A Natural Language Portal for Aggregated Fruit Fly Brain Observatory Data, Neurokernel Request for Comments, Neurokernel RFC #8, December 2016. NeuroGFX provides a programming interface to (i) query and retrieve modeling data from the NeuroArch database, (ii) configure circuit diagrams side-by-side with morphological information, e.g., silencing certain neurons, (iii) execute circuit on a Neurokernel server, and (iv) visualize and playback results with complete flexibility of what to show. 1. A. A. Lazar, N. H. Ukani, C.-H. Yeh, and Y. Zhou, NeuroGFX: A Graphical Functional Explorer for Fruit Fly Brain Circuits, Society for Neuroscience Abstracts, November 11-15, 2017, Washington, DC. 2. C.-H. Yeh, Y. Zhou, N. H. Ukani, and A. A. Lazar, NeuroGFX: a Graphical Functional Explorer for Fruit Fly Brain Observatory Circuits, Neurokernel Request for Comments, Neurokernel RFC #9, December 2016.